​Video: What is a Stroke? Your ability to understand what is happening in the world around you depends on the sensory information you can collect about the world around you, and how you are moving within it. You have many different receptor types, and your brain learns to rely on the most accurate reception feeds in order to decipher body position. The different receptors work in many different ways, some voltage gated, some mechanically gated, but they all lead to the creation of an action potential if the stimulus that is disturbing them from homeostasis is great enough. This action potential travels from the receptors in the periphery towards the central nervous system for processing. The cell body of afferent neurons are located in the peripheral nervous system. The axons of these neurons travel from ganglion and then lead back to the spinal cord. These type of neurons are considered unipolar meaning that they all have a very long single axon leaving the cell body towards the sensory organ and another, much shorter axon, leading towards the spinal chord. The cell body is smooth and rounded, and all the cell bodies of afferent neurons are clustered just outside the spinal chord, in something known as the dorsal root ganglion. All of the axons in the dorsal root, which contains afferent nerve fibers, are used in the transduction of somatosensory information. Different somatosensory receptors include senses such as pain, touch, temperature, itch, and stretch. All of the differents signals from the different peripheral sensors travel along the same general pathway towards the dorsal root ganglion to the spinal chord and then towards the brain. The neurons that travel from periphery to the spinal chord are considered 1st order, while the neuron in the spinal chord towards the brain are considered 2nd order. Finally, In the upper level of sensory neurons, from the medulla to the primary somatosensory cortex of the parietal lobe to the different processing areas of the brain, the nuerons are considered to be 3rd order. This afferent pathway is seen in the picture above. There are many different ways that the body can code for position and movement. And often if one of the methods of sense is disrupted, then the body can compensate by utilizing a different method. The roles of muscle spindles and golgi tendon organs are discussed below, but more information about them and there role in movement, can be found on the Efferent/Afferent with Movement Planning page. Muscle spindles are located in parallel with regular muscle fibres. When the muscle they are within changes length they change length to, and therefore code for muscle length. Golgi Tendon Organs are located in the tendons, which places them in series with the muscle fibres. This location allows the receptors to be stretch with the muscles, allowing them to code for the force being exerted by a muscle. 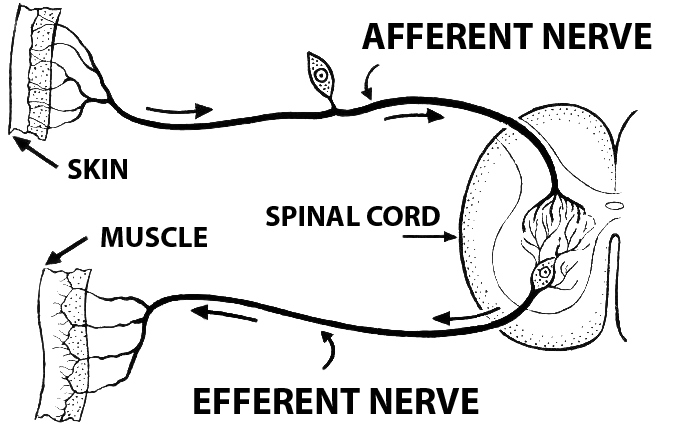 Different types of afferent fibres come from the different types of fibres. 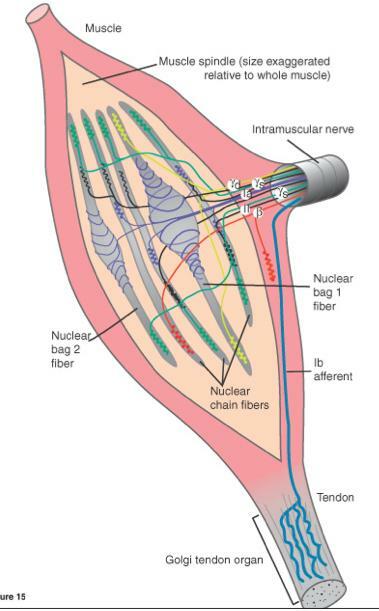 Within muscle spindles, two different types of fibres exist, called bag and chain fibres. The largest diameter afferent neurons, called 1a afferents, come from both the bag and chain fibres. Another type of afferent, called type 2, originate only from the chain fibres of the muscle spindles. Golgi organs contain type 1b afferent fibres. The name of the different afferents reflects the size of the neuron. 1a is the largest and the fastest at conduction, 1b is slightly smaller and slower at conduction. Finally, type 2 are the smallest and slowest conductors of action potentials. Type 1a and 2 (both present in bag fibres) are incredibly sensitive to changes in length of the muscle, but stop sending signals when the position of the muscle is constant, even when tonic contraction is still occurring. However, 1b afferents, though not so sensitive to the change in position of the muscle, are sensitive during active contractions, and therefore tonic contraction, because of the increase of force on the tendons. The central nervous system can control the sensitivity of muscle spindles through something called the Gamma Drive. The end of chain and bag fibres in muscle spindles contain contractile units. Gamma motor neurons from the spinal chord can stimulate this contractile fibres, causing shortening of the contractile units and therefore lengthening the muscle fibre. This brings the muscle spindle afferents closer to threshold, therefor increasing the sensitivity to further stretch in the muscle. Different levels of gamma drive can be utilized based on the situation. Static gamma drive causes contraction of the chain afferents, increasing the sensitivity of both 1a and 2 fibres. Dynamic gamma drive leads to contraction of bag fibres, increasing the sensitivity of only 1a afferents. Gamma drive changes based on the activity because too much of it can lead to a tremor. When sensitivity of the afferents is too high, stimuli that are not important enough to usually illicit a response may cause the travel of action potentials to the spinal chord. This large income of action potentials can lead to an over reaction of the reflexes, leading to back and forth contraction of agonists and antagonists in attempt to correct for each proceeding movement. Unlike the afferent system, the efferent system takes command from the brain and carries them away from the central nervous system into the periphery to effectors such as glands or muscles. The flow of information in the efferent pathway is exactly opposite to that in the afferent pathway. The structure of the efferent neuron is also different to those involved in afferent signal transduction. The cell body of the efferent neuron has several short dendrites that extend out of it, collecting signals from the spinal chord. From the other end of the cell body extends a single, long axon. This axon then forms a neuromuscular junction with the effector it is innervating. One of the most common type of efferent neurons are the motor neurons. These motor neuron are present in the grey matter of the medulla down to the spinal chord and all the way out to the effector muscle. There are many different types of motor neurons, from neurons that directly innervate muscle contraction to those that serve to adjust the sensitivity of sensory neurons. The descending pathway starts in the brain. More on the different areas of the brain involved in selecting and sequencing muscle patterns can be found on the page Efferents/Afferents with Movement Planning. From the brain, the pathway continues down to the spinal chord, where the motor neurons are located. The spinal chord also contains many interneurons that form the complex neural circuit that is involved in the processing of motor control, including spinal reflexes, and the processes required for rhythmic and autonomic movements. From the spinal chord, different motor neurons travel toward their effectors, to carry out the motor plans that are being sent down the pathway from the primary motor cortex. Many different types of motor neurons exist, the most important of them are discussed below. Alpha motor neurons come from the spinal chord and directly innervate the extrafusal fibres of skeletal muscles, causing movement. Alpha motor neurons release the neurotransmitter acetylcholine in the neuromuscular synapse. This causes an action potential to travel up and down the length of the muscle fibre, causing the movement of the actin and myosin elements against each other, shortening the muscle. 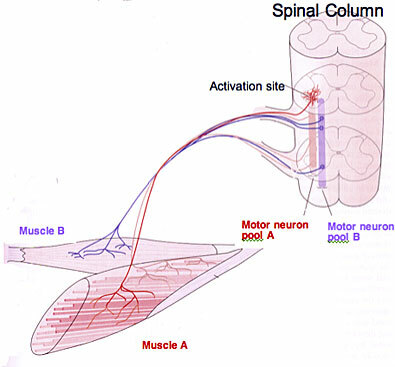 Each muscle has its own motor neuron pool within the spinal chord. This motor neuron pool contains all of the cell bodies of the alpha motor neurons that innervated that single muscle. A single alpha motor neuron and the muscle fibers it innervates is called a motor unit, a single muscle contains many motor units. For example, in your bicep, there are many alpha motor neurons that will innervate that single muscle, all of the cell bodies of those neurons are located in the pool, each of them making an individual motor unit. During the innervation of the muscle, the amount of motor neurons that are innervated out of all the possible neurons in the pool make up the innervation ratio. If a fine or delicate movement is required, then the motor pool will have a smaller innervation ratio. This means that each motor neuron will only innervate a small number of fibres allowing a larger amount of variety in movement across the limb. If a large, coarse movement is required, innervation ratios will be much larger, with most of the muscle fibres of each unit being recruited to complete the movement. Additional to the type of movement being completed, the recruitment of motor units depends on the strength of the signal coming down from the primary motor cortex. The stronger the signal, the more motor neurons that are recruited. The recruitment of neurons follows a size principle, with smaller neurons firing first, followed by larger neurons. 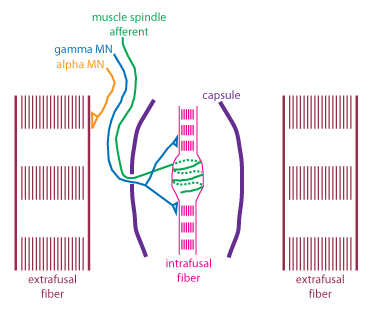 Approximately 30% of all fibers extending to the muscle are gamma motor neurons. Just like alpha motor neurons, they have their cell bodies located in the spinal chord. These motor neurons have smaller diameters than alpha motor neurons, making their conduction velocity much slower than that of alpha motor neurons. While alpha motor neurons innervate extrafusal muscle fibres, gamma motor neurons innervate the intrafusal muscle fibres of muscle spindles. Gamma neurons do not directly influence the length of muscles, but work to keep muscle spindles tight, therefor potentiating the signal from the alpha motor neurons, and allowing the muscle spindles to remain sensitive to further changes in muscle length. More on how the gamma motor neuron innervation can be found on the page Afferent System. Beta motor neurons are another kind of the lower level motor neurons. Though beta neurons are not as extensively understood like alpha motor neurons, it is know that they innervate the intrafusal fibres of the muscle spindles (see Afferents) with collaterals to the extrafusal fibres. Just like the other types of motor neurons, beta motor neurons originate from the spinal chord and travel to skeletal muscles. Beta muscles have smaller diameters than alpha neurons, and therefore conduct slower. 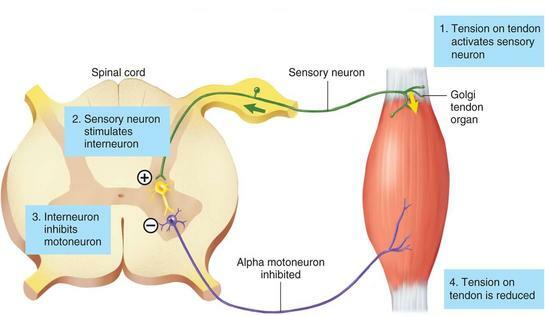 When the CNS sends signals down the descending pathway to the alpha neurons, signals are also sent to gamma motor neurons. This process is called alpha gamma co-activation. This mechanism is required to keep the intrafusal fibres and therefore the muscle spindles tight within a shortening muscle. Without this activation by the gamma motor neurons, muscle spindles would be very loose as the muscle contracts more and more. When the muscle spindles are loose, then can no longer detect the amount of stretch of the muscle, and therefore causing the spindle afferents to stop firing. Now, if the muscle were to be stretched again, the muscle spindle would not be able to code for this stretch because it is not longer able to fire due to being slack in the muscle. However, with alpha gamma co-activation where both alpha neurons and gamma neurons are present and firing simultaneously, muscle spindles are kept tight, and continuously coding for muscle length. In the image above, the firing of a muscle spindle is shown under different conditions. In condition A, which shows sustained stretch of a muscle, the muscle spindle causes firing of its 1a afferents following the stretch of the muscle. In condition B, the stretch on the muscle is removed, and only alpha motor neuron activation is allowed to the muscle. Here, the change in muscle length is not pick up by the muscle spindle as because the stretch is removed, and there is no innervation from the gamma motor neurons, the muscle spindle sits slack, and cannot generate action potentials. However, in condition C, when there is activation from the gamma motor neuron, the intrafusal fibres also contract, pulling the muscle spindle tight, allowing for it to fire and code for the changing muscle length. Combining all of These = Movement! Two types of pathways exist between the brain and the periphery, descending and ascending. The descending pathway (some of which is seen above) sends signals from the central nervous system to the peripheral nervous system. One of the most important descending pathways is the corticospinal tract, which brings motor commands from the brain to alpha motor neurons, innervating motor units, causing contractions. Posterior white column: brings unconscious perceptions to the brain, allowing for differentiation of touch, vibrations, etc. Spinocerebellar tract: carries conscious information from proprioceptors to the brain, such as from the muscles, joints, skin, etc. Ascending pathways send information from proprioceptors to the brain. distances of neighbouring limbs and the strength of limb movements. 3. Other - touch, temperature, light, sound etc. 4. Muscles Spindles - Are located in parallel with muscle fibres and are enclosed in the capsule with the intrafusal muscle fibres, within the extrafusal fibres (muscle fibres). They work via innervation from motor neurons. When alpha motor nuerons innervate extrafusal fibres, gamma motor neurons fire to innervate the the intrafusal fibres. This innervation keeps the muscle spindles taught in relation to the stretching extrafusal fibres surrounding it, which allows the spindle to be continuously stretched. When the muscle spindles are stretched, mechanically gated ion channels open, which causes an action potential, sending a single to the spinal chord. This signal codes for changes in muscle length. 5. Golgi Tendon Organs - Are located in series with muscle fibres in the tendons. The dendrites of the golgi are interwoven in the collagen of tendons, and when the muscles contract, the collagen us pulled tight which causes the GTO's to depolarize, sending action potentials to the spine. Different muscle tensions put different angles of pull on the tendon, allowing the GTO to differentiate and communicate information on the tension level. Stretch doesn't stimulate GTO's because most of the force of the stretch is absorbed by the muscle, and doesn't effect the tendon. Motor commands come from the brain and causes contraction of the muscles, proprioceptors send information about the contraction back to the brain for processing. 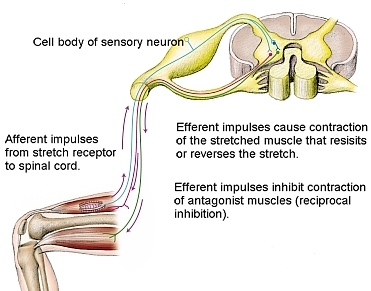 Sometimes, if the tension on a muscle or a stretch is great, then the sensory neurons can send a signal strong enough to active the interneurons. These short, locally projecting interneurons release GABA or glycine which bind on the alpha motor neurons and inhibit them from firing in response to the command they are receiving from the descending pathway. The interneurons work by blocking the receptors on the alpha motor neurons in the synapse from the excitatory neurotransmitters being released from the descending pathway. So your brain has selected an action to be completed, now what? 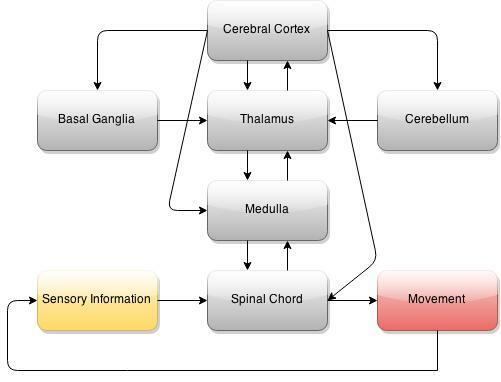 When the brain decides on a movement pattern, an action potential travels down the corticospinal descending pathway, leading to the firing of alpha motor neurons and therefore the contraction of desired muscles. The change in muscle position is picked up by the muscle spindles and golgi tendon organs. The action potentials created by these receptors travel to the spinal chord, synapsing on the interneurons of the spinal chord. The longer interneurons (2nd order neurons) carry information to the brain to be processed. The short interneurons within the spinal chord are also innervated, if the signal is strong enough, the interneuron will reach threshold, depolarize and inhibit the firing of the alpha motor neurons they synapse on (even if the motor neuron is still getting the go ahead from the brain). This inhibition will stop the muscle contraction (which is, in turn, picked up by the sensory neurons, and sent to the brain to be processed to figure out why contraction stopped). Why is Our Motor System Organized This Way? Closed loop reactions occur much faster than having the brain process and adjust movement commands. If the body is in an unsafe position, contractive state or receiving a painful stimulus, the closed loop can rectify the situation much quicker than voluntary movement plans. For example, in a maximal squat, if the tension on the muscle is too great, the golgi tendon organs will fire that information off to the spinal chord. This will cause the interneurons to fire, inhibiting the alpha motor neurons, letting the muscle relax. Although you will drop the weight, minimal muscle damage will occur. Additionally, you are born with reflexes. Babies do not know how to properly process sensory information, and therefore do not have adequate self preservation. However, reflexes can help keep babies safe throughout different postures. For example, when a baby is tipped over, they baby will contract muscles to right themselves against the falling motion, keeping themselves upright and safe. In order to produce voluntary movements in the mot accurate and coordinated way, you need constant input from the current muscle position. Having sensory neurons pick up on the contraction happening in "real time" allows the brain to be constantly updated on how a movement is going (however this isn't always possible in incredibly fast movements). If no information about the new location of limb segments reaches the brain during motion, limb trajectories could not be altered or adjusted. Many movements make use of the stretch reflex of muscle spindles to create more powerful movements. When "loading" is utilized prior to a movement, the muscle is stretched quickly, which can cause the muscle spindles to fire. This can cause muscles to contract to counteract the stretch, which can add to the voluntary contraction to generate more forceful contractions. For example, squat jumps are more powerful than a unloaded jump due to the utilization of the stretch reflex. This mechanism is similar to the way the flex of a hockey stick can add more power to a shot. What did they want to find? How are the reaching and grasping abilities different between normal and deafferented subjects? How does vision or lack there of affect this? - Trails were completed with and without vision, and in some trails, the movements were perturbed by a spring bing attached to the thumb and index finger, hindering the movement of the hand. The experiment revealed that the deafferented patients could complete the acceleration component of reaching just as well as controls, but the deceleration was slower and with more corrections in the patients. Removing the vision only made the abilities of the deafferented patient worse. Additionally, when the deafferented patient was subjected to the perturbed trails, the task could not be completed whatsoever. Finally, it was found that in the control group, vision allowed for the tasks to be completed much faster than those trials without vision. These results mean that we must have proprioception in order to efficiently and quickly adjust trajectories and make movements involved in prehension. When movement is hindered in someway without afferent feedback, there can be no compensation to make change in motor command. Additionally, this means that the brain also uses different modes of sensation to process and adjust movements, such as visual and proprioception. Can you use lokomat (a robotic exoskeleton) to assess limb position in patients with spinal chord injury? Both controls and subjects with incomplete spinal chord injury were tested. Subjects had their limbs put into 'target positions' with the lokomat, and told to remember it. Their legs were then moved to a random location and they had to use a joystick to move their legs back to the target position. It was found that patients with incomplete spinal chord injury were unable to properly return their legs back to target positions. These results allow us to draw the conclusion that the brain depends on interactions between the afferent and efferents systems to properly code body position. If no afferent feedback occurs, the brain cannot formulate a plan to get limbs to a target position, and a plan must be formulated a plan in order to properly create movement in the periphery.